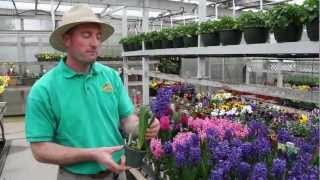 The hyacinth has a single stalk with a dense growth of several flowers available in a variety of colours. Hyacinth bulbs are poisonous because they contain oxalic acid. Protective gloves are advised when handling the bulbs to avoid mild irritation, especially those with sensitive skin. These flowers should have indirect sunlight and are to be moderately watered. Once the flowers die, trim them back and allow the bulbs to die naturally and regrow next year. Click here to see our Water Hyacinth.